Well Preserved Dinosaur Tail Found in Mexico. – All Things AAFS! 25/07/2013 by All Things AAFS! Well Preserved Dinosaur Tail Found in Mexico. A team of archaeologists and students from of the country’s National Institute for Anthropology and History (INAH) have found a remarkably well preserved fossilised remains of a suspected dinosaur tail, near the town of General Cepeda, Coahuila in northern Mexico. The director of the INAH, Francisco Aquilar, has said that the tail, which has been measured to be five yards long, is the first one of its kind to be found in Mexico. The tail was identified to be belonging to a hadrosaurid ( a duck-billed dinosaur), where it is likely representative of half the dinosaurs full length. 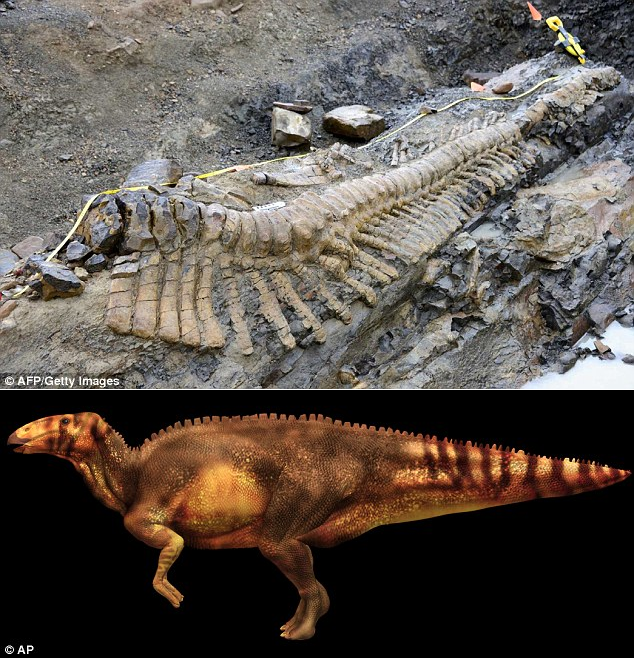 Top: The fossilised tail remains of the hadrosaur, recently discovered in northern Mexico. Bottom: A electronic artist rendering of the appearance of the suspected dinosaur. But this tail hasn’t been the only fossilised remains of dinosaurs that they have found on this archaeological site. The archaeologists have also found what is suspected to be one of the dinosaurs hips. There have also been numerous dinosaur remains found within the state of Coahuila, with Aguilar noting that they have “a very rich history of paleontology” within that area. There was an earlier fossilised remains discovery in 2010. The fossilised remains were of a never before discovered dinosaur within the same northern Mexico state as the recently discovered tail. The remains of the Coahuilaceratops, which was aptly named after the place of discovery, was discovered by a research group of palaeontologists from the Utah Museum of Natural History at the University of Utah. The excavation of the Coahuilaceratop marked the unearthing of the first horned dinosaur ever to be discovered in Mexico (News Center, 2010). Daily Mail. 2013. What happened to the rest of it? Archaeologists discover a 72million-year-old dinosaur tail in Mexican desert. Daily Mail News Online. Click here for an article about the dinosaur tail. News Center. 2010. First Horned Dinosaur from Mexico. University of Utah. Available here. To read the Unusual-ology post on the Ancient Egyptian use of lettuce as an aphrodisiac, click here, or how male spiders sacrifice themselves to their mate, click here. Looking for an interesting article on the recent vampire burials, and past vampire burials, clickety click here. This entry was posted in Anthropology, Archaeology, Palaeontology and tagged Archaeology, Coahuila, Coahuilaceratop, dinosaur, Francisco Aquilar, hadrosaur, hadrosaurid, mexico, National Institute for Anthropology and History, northern Mexico, palaeontology, University of Utah. Bookmark the permalink.